Over the next 28 days Philly Pressbox (https://phillypressbox.wordpress.com) (@phillypressbox) will be doing a review and analysis of each Phillies player, Manager Charlie Manuel and the coaching staff leading up to Opening Day 2012. On Day 16 we preview, Brian Schneider. 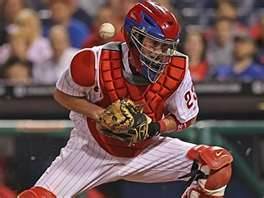 Brian Schneider – The 35 year old Schneider begins his 3rd season as the backup catcher to Carlos Ruiz for the Phillies. Schneider will also be entering his 13th big league season. Brian is known for his ability to be ready to play at any time as well as to work with any pitcher on the staff as needed. Over his 2 season with the Phillies, Schneider has played in 47 and 41 games relieving Ruiz. He has produced just a .208 batting average with 6 home runs in his 250 at bats. Over Schneiders’ career he’s only played over 100 games 6 times. His career batting average is .247. He spent 5 seasons in Montreal, 3 in Washington and 2 with the New York Mets before joining the Phillies in 2010. He’s made a nice career for himself as a quality journeyman catcher. He signed with the Phillies this offseason for another year at $800,000. Schneider does a nice job during his spot work as Ruiz backup. If Chooch can catch 110-120 games and Schneider handles the rest the Phillies will be in good hands. We would like to see a little more offense out of Schneider but that would be a bonus. If Ruiz were to go down to injury, the Phils would look for a veteran player to come in as the starter and Schneider would remain the backup. This is likely the final season of Brian’s career as he makes one last push for that elusive World Series ring. Tomorrow we will preview Jim Thome. The series: Day 1, Charlie Manuel. Day 2, The Coaching Staff. Day 3, Roy Halladay. Day 4, Cliff Lee. Day 5, Cole Hamels. Day 6, Vance Worley. Day 7, Joe Blanton. Day 8, Carlos “Chooch” Ruiz. Day 9, Ryan Howard. Day 10, Chase Utley. Day 11, Jimmy Rollins. Day 12, Placido Polanco. Day 13, John Mayberry, Jr. Day 14, Shane Victorino. Day 15, Hunter Pence. We would like to thank our sponsor for their support. Please check out the new trends for Spring Phillies baseball gear. http://www.shop.com/ul!52667!Spring+baseball-trends.xhtml?credituser=C9407795 Also, check out the All Sports Philadelphia Team Jerseys on the following link. http://www.shop.com/ul!52674!Philly+Jersey:s-trends.xhtml?credituser=C9407795. Lastly, click on the business card below to see all of what www.shop.com has to offer.